A guaranteed excellent lesson which can't fail, so ideal for Ofsted! I have come across several versions of the underlying concept behind this lesson, firstly at an INSET for Camden teachers in 1999 and subsequently in the Earthworks 3 text book by John Widdowson (published by John Murray, 2000). Earthworks, and the accompanying teacher's resources, has been a personal source of inspiration to me for many years, and this lesson is very much based on John Widdowson's work. In collaboration with another colleague, I have developed some further activities and resources to enhance the role-playing element. Inevitably Google Earth offers an opportunity to extend the lesson into a very realistic learning experience, although the lesson is perfectly viable without it. 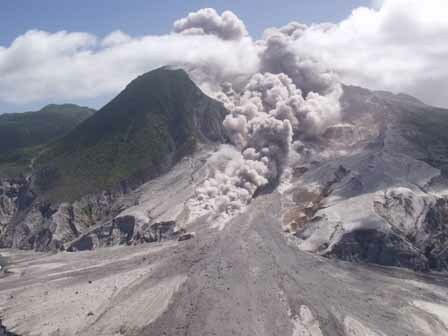 Special thanks to Sue Loughlin, Director of the Montserrat Volcano Observatory, and Adam Goss, Department of Earth and Atmospheric Sciences, Cornell University for permission to use their photographs. Bill Innanen's Montserrat Index page provided the missing link for a detailed map of the north of the island for part two of the lesson, as well as a host of other superb resources. Thanks also to Hodder Murray for permission to use the map extract from Earthworks 3 teachers resources. Adam Lawson has completed a brilliant movie to use as a lesson starter. Dan Williams contributed the risk assessment and hazard planning element of the exercise. This is a well-established lesson idea. Students react to the events on Montserrat whilst in role as a crisis management team based at the Montserrat Volcano Observatory. ICT is not necessary, though the lesson will be enhanced if one or more PCs are available. Google Earth and multiple computers provides the IC(T)ing on the cake. There will be a lot of noise and movement, so be prepared! A colleague and I have recently tested the lesson with two classes working simultaneously, with great success. Responding to a chronological sequence of events. Annotating a map with the key events. It is assumed that students are working in pairs or groups of three. Within the group there are roles for a geologist and a crisis planner and, optionally, an information coordinator (aka the runner). These roles are interchangeable. The activities will span two consecutive lessons. Ideally the following resources would be employed, although to be honest, the role-play would still work well without any form of ICT. Laptop computer or PC which acts as a teleprinter. Ideally there will be a PC and digital projector at the front of the class for the initial briefing and the final plenary session. A second PC or laptop situated in a corner of the room (or even outside the classroom in an empty room) acts as a teleprinter. If Google Earth is not available then there should at least be a wall map to locate the island. The "teleprinter" Power Point is set to run for approximately 22 minutes. During this time there is frantic activity as the runners collect the information. The geologist in the team annotates the A3 map with details of the volcanic events. Following each report from the teleprinter, the crisis manager makes an appropriate decision. The governor (aka teacher) assesses each group's performance in the risk assessment continually. This adds an element of competition between the groups, and provides an incentive to make the right decision under pressure. Once time has elapsed for producing the hazard map the teams should display their finished work. This can be compared with the real hazard map produced by the MVO in September 1997. The real map is available as a Google Earth overlay, a Word doc or a live web page. If time allows, the highest performing group in the decision-making task and the hazard mapping, should be encouraged to talk about their successful strategies. Bill Innanen's Montserrat Index page contains some brilliant resources, for example his animation of the MVO risk maps, and a quicktime VR panorama. Also on the site are the only detailed island maps available on the web. Absolute gold dust! BBC Scotland have an excellent online activity that makes a good follow-up activity. Some curious spelling errors though! I have received permission from the owners of all the copyrighted material used in these resources. Please DO NOT repost any of the material from this page. The Creative Commons License covering the rest of the site does not apply to the images on this page.